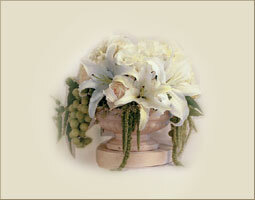 An elegant design of flowers with hanging Amaranthus and grapes in an urn. We specialize in anniversary floral arrangements, white flower arrangements, and anniversary floral gifts. We will have white flowers arranged and delivered promptly to your home or office in Beverly Hills, West Hollywood, Santa Monica and greater Los Angeles area.